Warmest Wishes is a more petite set from Birdie Brown that features a charming girl in her signature BB style. 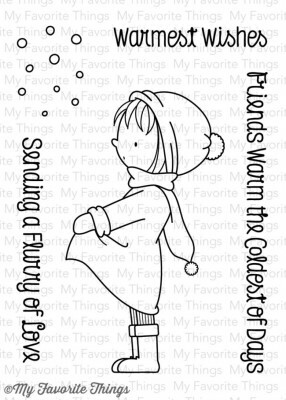 Also included are a graphic snow flurry accent, and three coordinating sentiments. The single piece Die-namics makes die-cut cuties a breeze to craft. This 5 piece set coordinates with the Warmest Wishes Die-namics and includes the following elements: Girl 1 5/8” x 3”, Friends Warm the Coldest of Days 3 1/8” x ¼”, Warmest Wishes 1 5/8” x 1/4”.